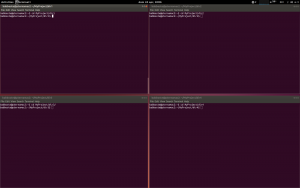 I was working on a project where I needed to open every time the same four terminals at different paths and I wanted to have command histories saved separately for each bash. The procedure relies on gnome-terminal. I use it on Ubuntu with Gnome. As far as I know Unity uses gnome-terminal as well, so the same should apply. 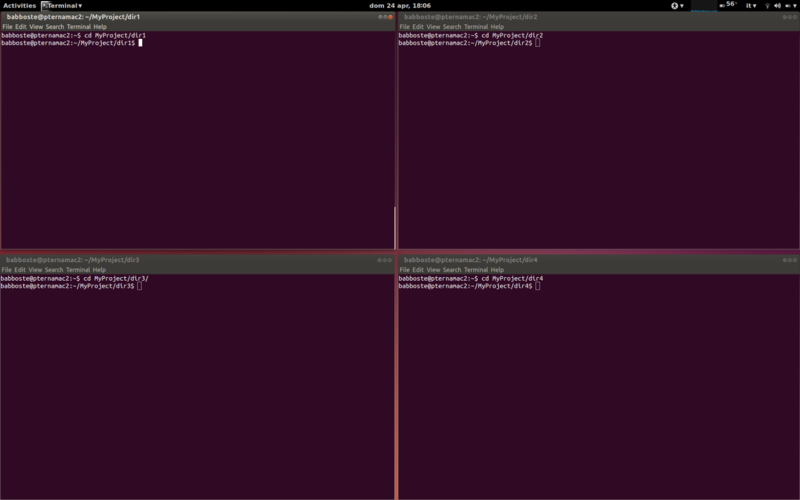 Each bash will have a different working directory. We are going to use working dirs as ‘unique identifiers’ of each bash. (This could be improved using some env var with a uuid to identify each bash). Of course each dir name can be customized. test it: [code language=”bash”]MyProject/open-terms.sh[/code] – you should see the four terminals opening at correct positions with the desired working dirs. Try searching the previous echo commands in different histories! Right click on it and “add to Favorites” to add it to Gnome side bar.